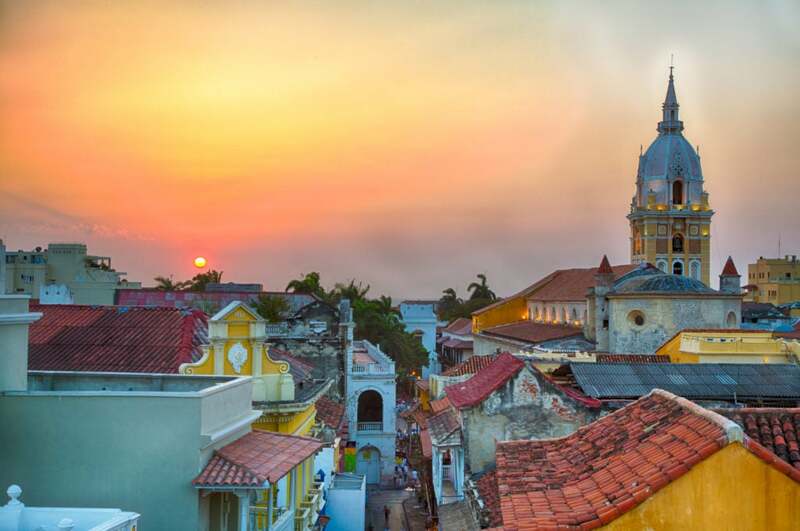 Cartagena, an inviting port city on Colombia’s Caribbean coast, is as colorful and vibrant as you might imagine, and an emerging tourist hotspot prime and ready for your wanderlust spirit to explore. It’s the most-visited city in country and for good reason. An abundance of lively nightlife options and trendy restaurants paired with the locals’ fun-loving, feel-good vibes make it an ideal quick escape for you and your girls, yet Cartagena’s rich cultural festivals, beautiful historical Walled City, breathtaking beaches and Caribbean climate make it the Jewel of the Indies’ and a tempting solo travel destination for the laid-back culture seeker. If you’re flying solo, and determined to traveling with a purpose, the city also provides adventure and sustainable travel accommodations and activities galore. And, not to mention Cartagena is just a short flight from the U.S. Eastern Coast, with direct flights from New York City, Miami and Fort Lauderdale. Here’s how to visited Cartagena two different ways, both of which offer one unforgettable vacation. Sustainable travel can sometimes get a bad rap. Those unfamiliar with environmentally-friendly travel tend to imagine that it means sleeping in hotels or hostels without air condition or modern amenities and living off the land. Wrong. Lounge on an oversize couch and look out onto the ocean or down a magnificently blended margarita at the bar as the birds fly by inside the property’s expansive open-air lobby. With décor to die-for, you’ll want to linger there long past check-in. The property’s rooftop is filled with solar panels and they recycle soap onsite. The hotel works with local farmers, fisherman and artists to ensure that all of the delectable menu offerings at the hotel restaurants are locally-sourced. Note: The ceviche at Biblioteka is a must and you haven’t lived until you’ve snacked on the red snapper by the pool at the Sea Salt Grill. All of the restaurants use bio-degradable products, and like all of Hilton’s properties, they’ve said farewell to plastic straws. The Conrad recruits and hires youth from surrounding native communities; many of whom were displaced by violence. DO: While all of this, plus the Conrad Cartagena’s super-friendly staff, open air spa, blissful beaches and four ocean front pools will certainly make it hard to leave, when you’re ready to visit the historic Walled City and immerse yourself in culture, the Conrad team offers guests exclusive experiences – complete with one, three, and five-hour itineraries, based on your interests and hosted by local community-friendly organizations and companies. 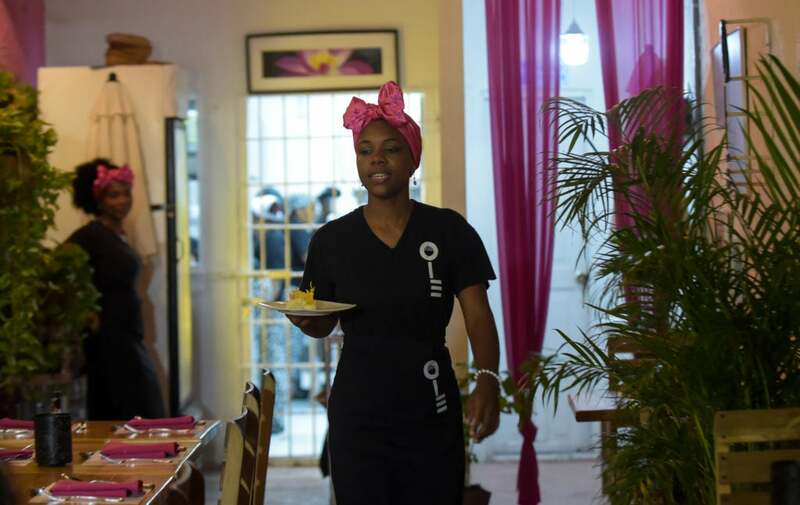 Note: Don’t miss making reservations for the best meal in town, at Interno, the restaurant inside the women’s prison that’s fully run and operated by inmates, who sing, dance, serve you with class and are more than willing to open up and share their stories. Cartagena is also the perfect girls getaway destination. A designated UNESCO World Heritage site, the city offers up amazing food, a rich culture, stunning architecture perfect for photo ops, and ummm… the eye candy is in abundance too. Plus, with all of those direct flights from the U.S., you and your girls don’t have to come from the same city in order to meet up and have a good time. Here a few tips to make the most of your Cartagena girls getaway one-of-a-kind. DO: It doesn’t take much to have a good time in Cartagena. During the day, grab your girls and wander through the cobblestone historic streets of Old Town and take in the beautiful sites. 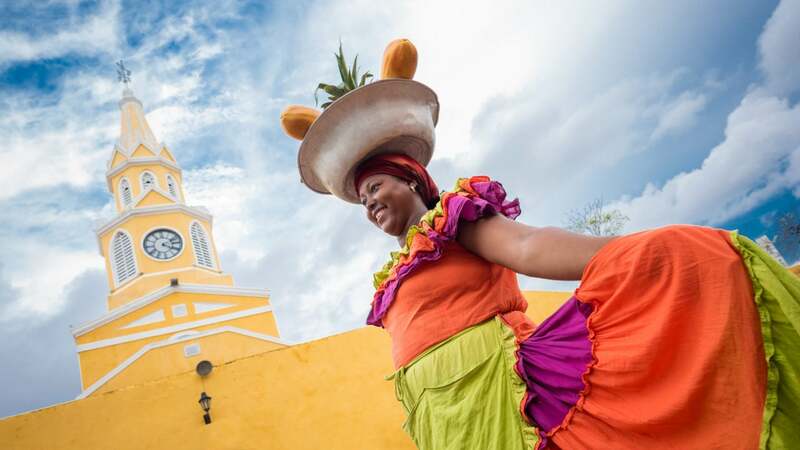 Scattered through the streets are the Las Pelenquera, or the fruit basket ladies, who wear brightly colored dresses and carry baskets of fruit around on their heads through the city. As you walk along the city, you’ll want to head into one of many museum’s (because you don’t want to turn up the whole trip) or climb the fortified walls to walk the periphery of the Old City. From there, a San Basilio de Palenque Tour is a must. If you’ve ever scoured the comments of the Nomadness Facebook group, you’ll know that Alexander Rocha’s (a local tour guide and community activist) Real Cartagena Experience tours offer up more on the rich culture of Cartagena, which is perfect for black travelers. Palenque de San Basilio is a UNESCO World Heritage site founded by escaped African slaves, which is where ships would arrive in Cartagena and slaves that actually did escape, would go back to help others escape as well. The town in fact, is still filled with the descendants of those slaves who have worked to preserve their culture and spread knowledge about it. Next on your Cartagena bucket list is the Mud Volcano — or Volcán de Lodo El Totumo — a 50-foot-tall mud bath renowned for its therapeutic qualities. While we can’t say for sure you will be “healed” after your visit, it will definitely make you float and there will be men there to offer up a massage for you in the mud, which at the very least will have you relaxed to continue on with the day’s festivities. And, it will definitely be perfect as you’re flicking it up for the ‘gram. EAT: Carmen, a restaurant situated inside the Anandá Boutique Hotel, is a moment. The decor, ambiance, and vibe is one you must experience when you’re deciding where to eat in Cartagena. Not to mention, the food is delicious: from grilled octopus to the catch of the day you’ll be wanting to come back daily. For most of your meals however, you’ll want to indulge in local cuisine by wandering around and tasting the street vendors, so don’t worry too much about reservations. Be sure to try the sancocho, fresh ceviche, arepas and empanadas. PLAY: The Old City comes to life at night, so you won’t have to travel far to have a good time. Colombians also know how to dance, so in addition to dropping it low a few times, you’ll need to get those hips ready for some salsa. Try hopping on a chiva, while you’re there — or Colombian party bus — so you can drink and dance the night away while also seeing different parts of the city.